The final stage of the 2018 Giro takes place across the center of Rome on an 11.8 kilometer circuit, to be raced 10 times. The route runs along many of the same roads used during the 2009 time trial, such as the Fori Imperiali, Via Nazionale, Via Sistina, Piazza del Popolo, Via del Corso, Via del Circo Massimo, across the Terme di Caracalla, and next to the Colosseum before the finish—possibly a sprint—at the Fori Imperiali. Sam Bennett (Bora-Hansgrohe) got his third win of the 2018 Giro d’Italia on the 21st and final stage of the 2018 Giro d’Italia. Elia Viviani (Quick Step-Floors) came in second, with Jean-Pierre Drucker (BMC) rounding out the podium in third. Chris Froome crossed the finish line to claim his first Giro d’Italia title and complete his sensational comeback. In his post-race interview, Bennett noted how hard the past two days had been for him and how he was thrilled to have enough left for a stage win. “The last two days I was suffering so much. I went too deep in the first two weeks, and I paid for it the past few days in the mountains. The team did a great job in the finale. While Bennett basked in the glory of his stage win, Froome, the overall winner, was waiting for the gravity of his monumental win to sink in. “I don’t think it has quite sunk in yet. It will over the next few days after I have some time to reflect. This is the dream of all cyclists to have all three leaders jerseys. 2. Elia Viviani (Quick-Step Floors) s.t. 3. Jean-Pierre Drucker (BMC Racing Team) s.t. 4. Baptiste Planckaert (Team Katusha Alpecin) s.t. 5. Manuel Belletti (Androni Giocattoli-Sidermec) s.t. 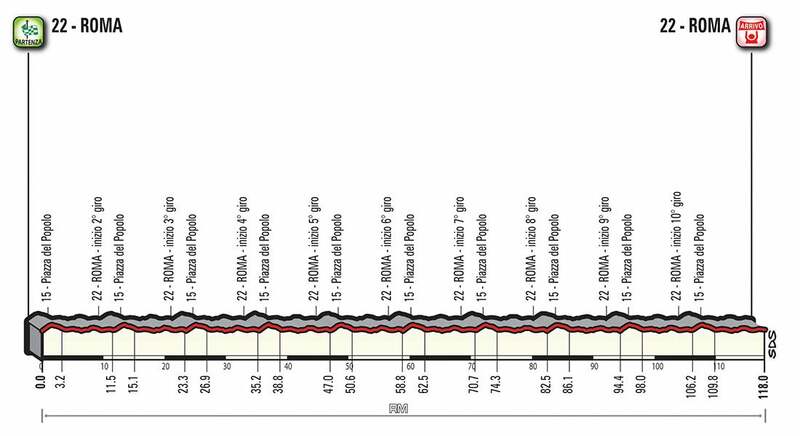 The 115-kilometer stage featured a circuit in the center of Rome. Unfortunately, the stage was marked by early protests, which saw the GC neutralized after the first three laps. This allowed the main contenders sit up for an easy ride while a reduced peloton of sprinters and stage hunters kept on the pace to keep the early break in check. Two riders, Viacheslav Kuznetsov (Katusha-Alpecin) and Chris Juul-Jensen (Mitchelton-Scott) held a small gap over the hard-charging peloton with 20-kilometers remaining. They were reeled in with 12 kilometers to go as the Trek-Segafredo team lined up for the technical final lap. A dangerous group including Ryan Mullen (Trek-Segafredo) and Tony Martin (Katusha-Alpecin) escaped with 11km to go. While they had plenty of big motors in the group, the Bora team of Bennett hit the front and set an infernal pace to bring it all back together with 3.5km to the line. The Quick-Step team of Viviani set up a picture-perfect sprint train inside the final 2km, and the Italian launched his sprint from 200 meters. Unfortunately for him, Bennett was directly on his wheel and was able to turn over a huge gear on the final straight to overtake the Olympic champion. Viviani won the Maglia Ciclamino for the best sprinter classification, Froome won the Maglia Azzurra as the best climber and Miguel Angel Lopez (Astana) won the Maglia Bianca as the best young rider. With his overall win, Froome becomes the seventh rider in cycling history to win all three grand tours, and the first British rider to win the Giro d’Italia. He also becomes the third rider ever to win three consecutive grand tours. Froome plans to line up for the 2018 Tour de France in an attempt to become the first rider since Marco Pantani in 1999 to win the Giro-Tour double.